Never being a fan or even really familiar with a band that is being honored with a tribute album makes it hard to judge the tribute album. I didn't recognize any of the songs. So, for all I know, they could be originals. Though, obviously they're not. But, it seemed the best way to judge the album without knowing anything about the originals. Plus, if the band was any good the first time around, no fan is really going to do the songs any better. How many Beatles covers have you heard done better than the Beatles? None... my point exactly. With all that being said, this is a wonderful, bright pop album with plenty of, well, pop music for you to enjoy. From the sugary pop of Tom Davis covering "When Will You Be Mine," Gary & The Gripweeds bouncy rendition of "Rock And Roll Love Letter," and Words doing "Yesterday's Hero" with a twitching rock 'n' roll beat and some disco fluids to Fudge's version of "Love Power," this album has a lot of pop to enjoy. And whether the originals were good or not, I don't know. But, if the bands on this album are covering their songs, they must have liked them. 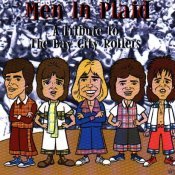 If you're a fan of the Bay City Rollers and enjoy warm pop music, this one is a must have. If you don't like the Bay City Rollers or are oblivious to them (such as me) but like pop music, there are some good pop melodies you'll enjoy here as well. If none of the above applies, forget about it. I'll give it a C+.